1. 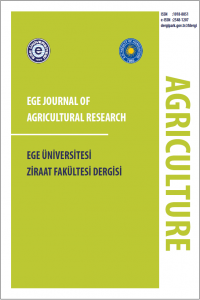 The Journal of Agriculture Faculty of Ege University is published four issues in a year as in March, June, September, and December. 2. The journal publishes original research articles in the field of Agricultural Sciences that have not been published previously, original research articles that have been published only as an abstract in proceedings books, and also reviews articles that are suitable for the scope of the journal (an article in each issue). Letters to the editor are not accepted for publication. 3. If the first authors are the same in the manuscripts, only two of them are accepted for the publication in the same issue. 4. No royalty is paid to the authors. There is no fee from the accepted articles. 5. Authors are responsible for the scientific content of the manuscripts to be published. 7. The research articles should be prepared in English (or Turkish) generally under the main headings; Title, Abstract in Turkish and in English (structured), Keywords in Turkish and in English, Introduction, Material and Methods, Findings, Discussion, Results and References. If requested “Findings” and “Discussion” can be written in a single title as “Findings and Discussion”. The review articles, writing rules and process are the same as the research articles. Review articles should include at least 50 references, at least 75 % of which should be within the last 10 years and should not have been published in any other publication. 8. Abstract must include information on objectives of the research; approach and methodology, and important research findings. Do not use all uppercase for the title of your abstract. a. Turkish Translations of the Abstracts (structured) to be submitted from the manuscripts abroad will be performed by Editorial Board. b. Abstracts should be written in English apart from manuscript and length is limited to a maximum of 200 words. c. Avoid from using author details, diagrams, references, and abbreviations except from commonly used ones in the manuscript. d. Provide relevant keywords to a maximum 4-6 words leaving a linespacing after the abstract. Do not simply repeat words from the abstract title only. 9. The full specific name; genus plus species, is italicized. Dots are used in the expression of decimals. 11. Any citation in your articles to at least one article among the previous papers published in our journal has great importance for contribution to the application of Ege University Journal of Faculty of Agriculture to SCIENCE CITATION INDEX (SCI). a. Manuscripts must be submitted in Word. All parts of the manuscript must be typewritten, single column, double-spaced, with margins of at least one inch on all sides. The author must use a normal, plain font (e.g., 12-point Times Roman) for text and save the paper in docx format (Word 2007 or higher). Number manuscript pages consecutively through-out the paper and not to exceed 20 pages in total. b. Text lines should also be numbered (continuously throughout all pages) to facilitate the review process. c. The title of the article should be written size 14 point, bold, centered. Only the first letter of each words should be a capital and the rest in lower case letters. d. The names of the authors should be written in lower case letters; bold letters, point 12, centered and separated from the title by one line space. The name(s) of the author(s) should be written with the surname in full and capital letters. Present the authors' affiliation addresses (where the actual work was done) below the names. Indicate all affiliations with a lower-case superscript letter immediately after the author's name and in front of the appropriate address. Specify by asterisk the corresponding author. Leave one line space and write the e-mail author only, centered, point 10 characters. e. A maximum number of three levels of headings are recommended. First-level headings should start in the left margin with the first letter of each major word capitalized, bold, Times New Roman 12 pt font. Second-level headings should be bold, left margin, with only the first letter of the first word capitalized. Third-level headings are discouraged, but, if required, should begin on the left margin, only the first letter of the word should be a capital and the rest in lower case letters. f. The main body of the manuscript should be double-spaced Times New Roman 12 pt font. All paragraphs should start at the left margin. The text should be fully justified. There should be no hyphenation (cutting words). The authors are discouraged from highlighting text with the use of bold or underlined fonts. g. Academic and/or other professional institutions of the authors should be mentioned with 10 pt font using superscript on the number. 13. The system of “author and year” should be used for references in the manuscript except special cases. If there is more than one reference, then the references should be given in chronological order. References in the text consist of the author(s) name and publication year in parentheses, for example: Surname1 (2007), Surname1 and Surname2 (2005), Surname1 et al. (2003). If several references are cited collectively, they are enclosed in parentheses with no additional parentheses around dates, and separated by semicolons (SurnameA, 2002; SurnameB et al., 2008; SurnameC, 2008; SurnameD1 and SurnameD2, 2012). Multiple entries for one author or one group of authors should be ordered chronologically, and multiple entries for the same year should be distinguished by appending sequential lower-case letters to the year, even if the author groups are not identical: e.g., N. Mordoğan and C. Karagözlü. 1999a; N. Mordoğan & C. Karagözlü. 1999b; N. Mordoğan and C. and Karagözlü E. 1999c (because all will appear as " Mordoğan et al., 1999" in the text). 14. References should appear together at the end of the paper, listed alphabetically by the last name of the first author. All references cited in the text should be listed in the References section. If two or more references by the same author are listed, the earliest dated work appears first. First letter of each word for the titles of the books and book chapters should be in capital. Publishing number for Institutional publishing or publisher's name and address should be given. First line of the reference should be at the beginning of paragraph and following lines must be drawn in of 0.5 cm. Journal titles must be written in full. Lodos, N. 1998. Türkiye Entomolojisi VI (Genel, Uygulamalı ve Faunistik) (I. Basım). Ege Üniversitesi Ziraat Fakültesi Yayın No:529, 300 s.
National Research Council. 1994. Nutrient Requirements of Poultry. 9th rev. Ed. National Academy Press, Washington, DC, p. 176. Metcalfe, J., M.K. Stock and R.L. Ingermann. 1984. The effects of oxygen on growth and development of the chick embryo. In: Respiration and Metabolism of Embriyonic Vertebrates. 4th ed. (Eds: R.S. Seymour and W. Junk), Dordrecht, The Netherland, pp. 205-219. Parsons, C.M. 1994. Amino acid availability for poultry. 9th European Poultry Conference, World’s Poultry Science Association, Book of proceedings, Glasgow, UK, Vol: 2, pp. 356-359. Lodos, N. ve A. Kalkandelen. 1988. Preliminary list of Auchenorrhyncha with notes on distribution and importance of Turkey, XXVII. (Addenda and Corrigenda). Türkiye Entomoloji Dergisi, 12(1): 11-22. Bagley, L.G. and V.L. Christensen. 1991. Hatchability and physiology of turkey embryos incubated at sea level with increased eggshell permeability. Poultry Science, 70: 1412-1418. URL: As a minimum, the full URL should be given and the date when the reference was last accessed. Any further information, if known (DOI, author names, dates, reference to a source publication, etc. ), should also be given. Schaeffer, L.R. 1997. Subject: Random regressions. http://chuckagsci.colostate.edu/wais/logs/agdg869258263.html . Erişim: Kasım, 1997.